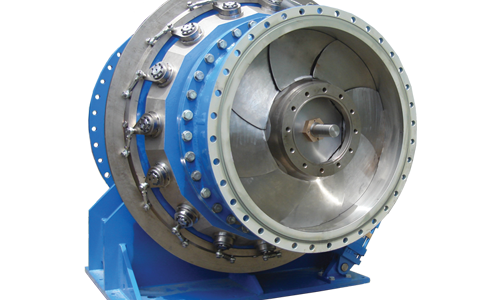 Kaplan turbines are recommended for low head applications. They generally have a flow range extending from 30 – 110% of the nominal flow rate. Double Regulated Kaplan turbines have both variable guide vanes and runner blades which ensure a high and flat efficiency curve across the entire flow range. These turbines can also be offered as single regulating and fixed flow (propeller) machines.